In today's look back at the best main dishes, TWO soups made the list! We do like soup at our house, and these two are awesome. There will be more main dishes coming up in the CrockPot/Instant Pot category (Saturday) and on the Most Popular Posts (Sunday) so stay tuned! This soup is SUCH a winner. This is my favorite way to eat butternut squash, and we love the combination of squash and curry. I've made it with rice noodles and jasmine rice, and later in the fall I tried it with couscous. The texture of couscous is PERFECT with this soup - so if you make it, I hope you'll try it too! We really enjoyed this chicken dish; and then I made it with shrimp a few weeks later and it was equally good! 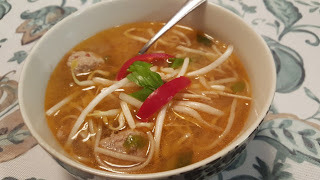 I introduced my family to pho on vacation this past summer and so I was excited to find this fun recipe to try at home. This isn't pho, but it reminded them enough of it, and we loved the flavors and textures in this soup. Thanks to Sarah at Fantastical Sharing of Recipes for hosting the Countdown! Alright, I'm totally stealing your idea to put shrimp in a butternut squash soup! It sounds lovely!